I agree with Casey that the 7-dot ellipsis is an exceptional punctuation innovation here, I have no idea why you would put a qualifying word like "about" in quotation marks - is it exactly ten, or not? aaah! As annoying as it is, most shoppers seem to use the 10 as an approximation. So perhaps the sign maker was just being realistic? 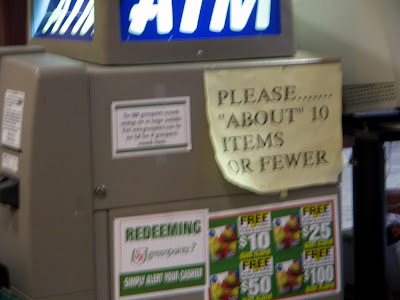 I'm conflicted about this, because you do have the unnecessary quotes--and the overly-dotty and uncalled for ellipses--but they used "fewer" instead of the oft-misused and anger-inducing "less." I can't decide if this sign is good or evil!